In an earlier post I talked about using Raspberry Pi as a remote desktop client. That set-up was pointing towards a single server. 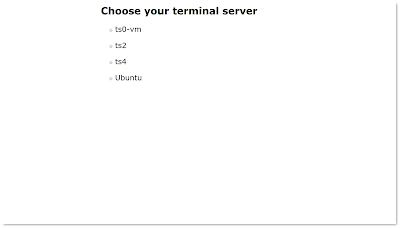 This variation allows the user to choose their terminal server. 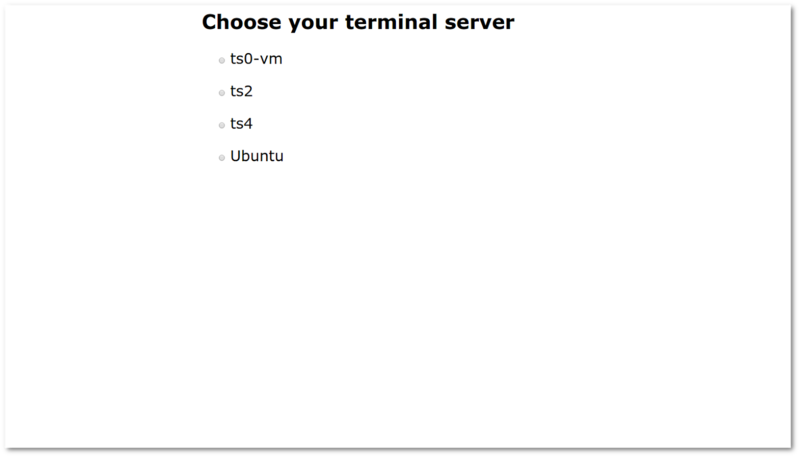 This is useful where desks are shared by users with different terminal servers. This version displays a locally stored html file in a Chromium Kiosk. When the user selects their terminal server netcat is waiting for the HTML form post, greps the terminal server value and runs the rdesktop command. This is done in a never ending loop. The matchbox-window-manager is used to get the kiosk full-screen and with a nice looking mouse pointer. logger "$0 After netcat: $response"
/usr/bin/rdesktop -r sound:local -u "" -f "$terminalServer"